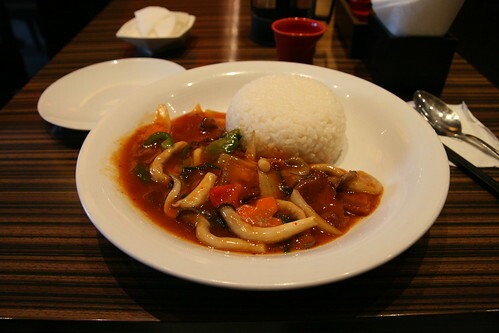 On my way to see Ninja Assassin this week I popped into Yongsan's IPark Mall to find something tasty for lunch. Unfortunately unless you like bad Japanese food, imitation spaghetti or coffee and doughnuts then there's not much choice. After searching the levels I settled upon what looked like the best of a bad bunch: KhuaThai. I know that one must allow for a certain amount of artistic license when it comes to menu pictures, but it is my firm belief that Khuathai have over stepped the mark. The only thing remotely similar in both of these pictures are the chopsticks... No coriander, no thick chunky pieces of pork, no contest. The thin slices of very crispy (one might say overdone) belly pork weren't too bad in and of themselves. The mushrooms, carrots and peppers were all fresh. However, these ingredients were swamped in a translucent spicy gloopy sauce that didn't say Thai as much as it said cheap Korean-Chinese... I'm not an expert on Thai food and I'd love to here what all my wonderful readers think, but this is nothing like the Thai food I've ever had before. 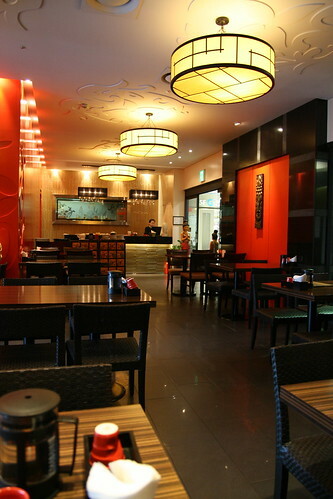 I felt like I was eating in a Chinese restaurant in an American shopping mall, not transported to Bangkok. The worst thing about it is there is nowhere decent to eat within the mall (or at least I haven't found the holy grail of restaurants there yet). Yongsan station holds very little excitement in the way of food for me and it saddens me to think of the paucity of delicious tidbits near my local cinema. 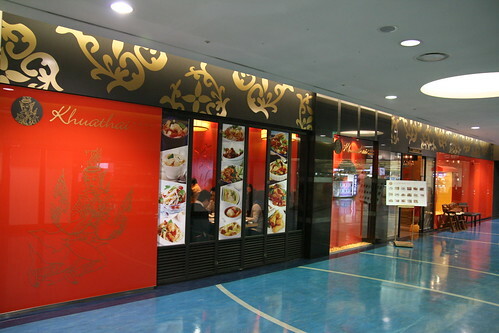 You can avoid Khuathai by not visiting the fifth floor of the Yongsan IPark Mall and by not calling them on 02 2012 0567. You're right, that stuff looks pretty hinkey. 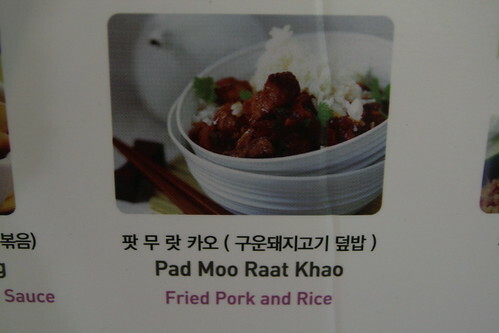 The key to the name Pad Moo Raat Kao (Pronounced Laat Kao) means Fried pork sauce rice. 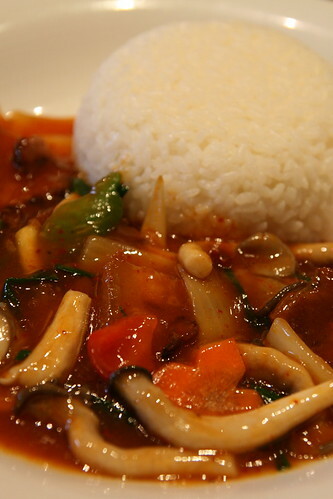 Laat is usually only made with a dish called Laat Na. and it's more of a savory sauce instead. I'm lucky and get Lao/Thai food home cooked since the Mrs. is an awesome cook. The key to good Thai food is to find one owned by a Thai. There are a few good ones down south in Songtan in Pyongtaek. Thailand 2 is my favorite since the cook makes a few things for me that aren't on the menu for when my wife is away from Korea. You are one lucky man! Thanks for the info, I'll have to get down to Songtan at some point and try Thailand 2 out.